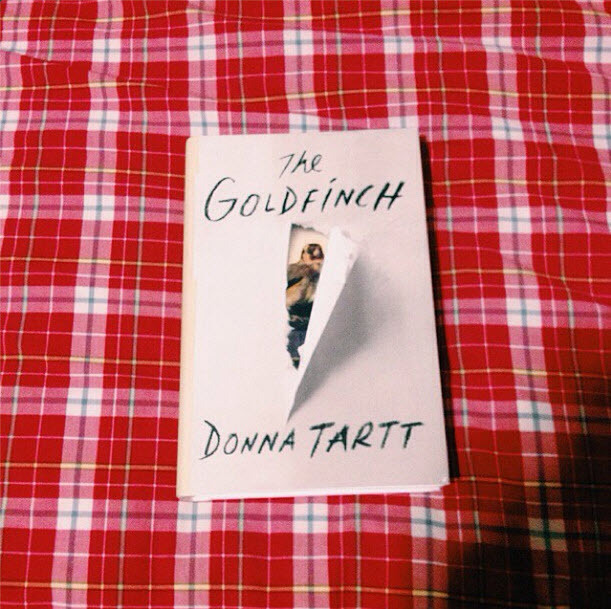 Last night, sometime during the hour before midnight, I sat propped up in my bed with tears streaming down my face as I finished the last page of The Goldfinch by Donna Tartt. My eyes had welled up intermittently while reading the last 20 pages or so, but as I faced the absolute end of the book – one of the most beautiful and affecting endings I’ve ever read, I think – there was nothing stopping me from truly crying. I was sad to leave the world that I’d been completely immersed in for the past few days, yet ecstatically happy that I’d been able to be immersed in that world at all. I’ll need a while to think about this book before I really write about it. However, I didn’t want to let another moment pass before giving it my full endorsement here. I’m only a recent convert to the “cult of Donna Tartt”. Reading her first novel, The Secret History, was one of the most entertaining and intellectually satisfying experiences I had this year. I’ll say the same for reading The Goldfinch, but with much more emphasis. It was one of the most pleasurable reading experiences I’ve had…ever. This morning, I told a friend that I’d finished the book and he asked if he could borrow it. Yes, I said, of course. But I couldn’t help but acknowledge how sad it would make me to give the book away, to let it be in another person’s possession. To let another person have their own experience with The Goldfinch. Yet, there are so many people who have already read or will read the book. I’ll encounter and engage with their opinions and interpretations of the novel eventually, I’m sure. For a little while longer, though, I just want it to be me and The Goldfinch, alone together.